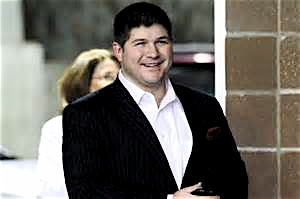 Political operative Jesse Benton, campaign manager for Sen. Mitch McConnell. Something always seemed one-off when it was announced last September that Jesse Benton, who ran the successful campaign of Rand Paul for Senate, was being hired by Mitch McConnell as his campaign manager. Especially considering McConnell backed Paul’s opponent, Trey Grayson, in the 2010 Republican primary. There was bad blood there on both sides, and turns out that distaste remains. Yesterday a recording surfaced of a phone conversation where Benton says, “I’m sort of holding my nose for two years,” referring to the time when he must work on McConnell’s 2014 re-election bid. The spin on all this is, Benton feels working for McConnell now will help with Rand Paul’s possible presidential run in 2016. The recording was published by the Economic Policy Journal, which said it was made in January 2013 when Dennis Fusaro of the Reformed Theological Seminary called Benton to ask a question about the presidential campaign of U.S. Rep. Ron Paul. Follow close, ’cause this gets thick fast. Former Rep. Ron Paul (R-TX), and father of Rand Paul. Rand Paul is the son of former Rep. Ron Paul (R-TX), who was the Libertarian Party candidate for president in 2012. Benton is married to Ron Paul’s granddaughter and was spokesman for Paul’s presidential campaign, after having run Rand Paul’s victorious 2010 election bid over Attorney General Jack Conway. Unlike many political operatives who are just hired guns, Benton is more than casually committed to the Paul family. He also is a libertarian activist, who works closely with conservatives, like Sen. David Vitter (R-LA), and libertarian organizations like Americans for Tax Reform, the Liberty Coalition and the American Conservative Union. Benton works for candidates and organizations to push his own political agenda. This story about the taped phone conversation is troubling for two reasons. One, clearly McConnell will do anything, including sucking up his pride to hire Benton, in order to appear more conservative to Tea Party members, who hold a powerful sway in Kentucky. 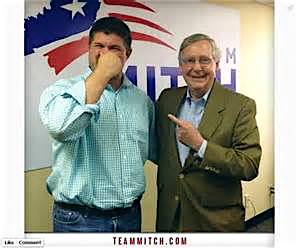 McConnell hoped that by hiring Benton he could scare off any possible challengers in his upcoming primary. OOPS! Republican businessman Matt Bevin of Louisville announced his primary campaign against McConnell last month. Bevin is backed by several Tea Party activists in the state. McConnell is viewed suspiciously by the Tea Party movement, and now his credibility is further in question. He has spent much of his career bringing taxpayer money back to Kentucky. He supported the bailout package in late 2008 as the economy looked near collapse and has backed an untold number of resolutions raising the debt ceiling. That doesn’t smell like Tea Party – and they know it. Secondly, is there a greater manipulation underfoot between Paul, McConnell and Benton? McConnell has always been a mumbler and an opportunist, more interested in the power associated with holding a Senate seat, particularly the title of Senate Majority Leader. McConnell says what he has to say to keep his job, but it’s questionable if he really believes the rhetoric. Rand Paul and Jesse Benton are true believers. They cloak hate, fear, racial separatism, secessionist philosophies and limiting public assistance behind the guise of the Tea Party. This is a message they aspire to take to a national audience soon. Bevin’s campaign immediately seized on the Benton recording. This entry was posted in News and tagged Jesse Benton, Kentucky, Matt Bevin, Mitch McConnell, Rand Paul, Ron Paul, Tea Party. Bookmark the permalink.